Today’s homeowners want their personal spaces to be expressions of their personal taste and, at the same time, suit their lifestyles – and pockets. Crabtree’s Slimline plug system – a new three-pin plug, adaptor and socket design that incorporates several significant safety features, is more convenient than the traditional three-pin plug and carries the SABS mark of approval. The new plug standard became compulsory in January this year and will become the standard plug-top and socket combination for the future. Slim, elegant and easy-to-use, the new compact plug is an alternative to the large and bulky design of conventional products. Where once there would only have been space for two plugs, the new design accommodates four plugs, ensuring maximum usage of the 100 x 100 mm wall box format. The new plug comes with a matching range of adaptors, which means that existing wall sockets do not have to be replaced. 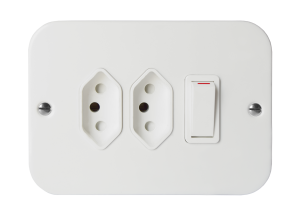 Wall sockets incorporating the new format are also available in the Crabtree range of switches and sockets. By replacing your moulded earthed plug with the compact three-pin, greater flexibility in the office and at home is now possible. In addition to its space-saving benefits and superior looks, the new compact three-pin plug is user friendly. In the past, appliances have been sold with a standard plug, which unlike the new plug, cannot be adjusted. The new compact three-pin plug can be wired to allow the cord to exit either at the top or at the bottom of the socket or adaptor, which is ideal for tight spaces. 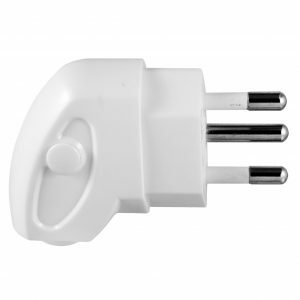 The Slimline range conforms to the international standard IEC 60906-1, which was modelled on the standard European 2.5 A two-pin plug with the addition of a third, earthed pin. The most important feature of the compact plug system is its safety. Usually, the earth pin activates the shutter mechanism for all contacts, making the system susceptible to tampering. However, the Slimline compact three-pin plug design addresses this with a unique shutter system, an extended 15 mm pin sleeve and a recessed socket ensuring that it’s not possible to touch the pin while contact is made with the outlet contact. These engineered characteristics benefit children who are the most vulnerable of users, allowing even the smallest what? to insert and withdraw this plug safely. The new three-pin plugs and the accompanying range of adaptor and sockets are available from Crabtree.